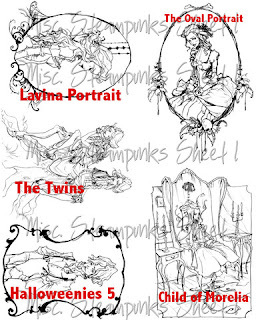 This month over at Poisoned Peas Please!, we're using Simply Betty stamps for our Steampunk challenge. I chose Betty's "Child of Morella" image after figuring out who Morella is. Turns out she's "a" character in a very short Edgar Allan Poe poem. It's a 10 minute read if you want to have a looksee. She appealed to me because 1. I liked the image (THAT was easy! ), 2. I'm from MD and Poe was a Baltimore boy so there's that whole thing and 3. I've just always liked Poe. Of course, there was the high school English teacher that read "The Raven" to us in a dark classroom, reading by flashlight and periodically shining the light on a very realistic picture of a raven above the door. I guess that helped too. LOL. In a very prosaic nutshell, Morella is a brilliant woman and has extensively read "forbidden and mystical writings." Her husband, the narrator, at first thinks it's fascinating and then eventually is completely skeeved by it. Morella dies giving birth to "the child of Morella" who dad never names. She grows to adolescence VERY quickly and reminds dad hugely of mom. When he has her baptized, for reasons he doesn't know, he calls her "Morella" and she immediately dies. When he puts her in the family tomb, mom's no longer there- it's as if she were simply reborn as her own daughter. Hey! It's Poe. What did you expect? Sunshine and roses? Well, maybe three roses mysteriously left on his grave but that's a whole different story. Anywho. I used the image on a heavily steampunk-embellished tag. Note: The first image is my updated tag, the 2nd image was my original. Wow, I love it, especially all the little rivets on the right side. Wow! You really "punked" this one! It's aawesome! Thanks for hopping through my blog! I love this Jen! I knew that you would enjoy this side of you! Great coloring and layout!